My green friend, Thistle, was inspired by Sunday's post to create a t-shirt of her own, honoring survivors of the Freeze Yer Buns Challenge. 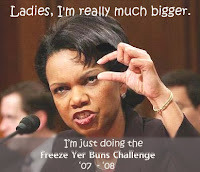 It's hard to read the tag line at the bottom, but it says "I survived the Freeze Yer Buns Off Challenge '08". So, for all of you proud, frozen peeps out there, go check out the collection. Although the thong might be a bit chilly. :-) And what happened to your canard, when I made that suggestion, that NO one would want to see it?? hm?? I'm still waiting for more of those "Freeze Yer Knockers" t-shirts! My husband loves it cold so we keep it pretty cold, doesn't work out well in the summer but I turn the AC way up while he is at work to help make up for it. The problem is while we are with my in-laws for now they don't like it as cold lol.